What does discipleship look like with college students? Often, it isn’t what you might think. Today I met with two great men, though they are spiritually young. We have been reading through Discipleship Essentials by Greg Ogden (a great tool for discipleship). As happens often, actually, the was a misunderstanding and neither one of them did the homework from the workbook that I had spent a decent amount of time making sure I had done to be prepared for out time. They had instead read an article called This World: Battlefield or Playground that I had given them as an addendum from last’s week discipleship lesson. I was therefore sitting there with nothing “prepared” but my own biblical knowledge. As we began to hang out and I asked them how they were doing, it was mentioned that the recent homecoming king and queen were part of the GLBU, and had cross-dressed for the homecoming ceremony and football game. This did not particularly surprise me about our particular campus of Northern Arizona University. I decided it would be a good time to look at Romans 1 and discern what God thinks of this kind of display. I opened to this section mainly to look at Romans 1:32—”and although they know the ordinances of God, that those who practice such things are worthy of death,they not only do the same, but also give hearty approval to those who practice them.” We also looked at 2 Timothy 3:1-5 and they were amazed to see these verses that seem to be describing our culture right now in Flagstaff and in the United States. We started reading the article, pausing to look at Psalms 1 & 2 and talking about how the are 2 kingdoms in this world, and that God laughs at the pitiful attempts to fight against Him, but also at the wrath of God against ungodliness, and the benefit towards those who “kiss the Son”. We talked about how if we see the world as a playground, we tend to live for when we can frolic, but if we see the world as a battlefield, then we expect to fight. We talked about how we are not yet home, but await the rest from the battle. We talked about how we get a bit of the foretaste of home inside the people of God through the Spirit. Then I asked what we are going to change in light of these truths. Both of them talked about reding the bible more consistently. One talked about being more bold in speaking up in class as well as speaking to friends about spiritual issues. I took away the need to spend much, much more time in prayer for those that God has given to Lori and I to shepherd. I didn’t plan to talk about these things, but it is one of the foundational things that affects how I view life, that affects my daily living. It is a worldview issue that I’m not sure would have really come up in our discipleship. Wats fun is that they really want to have a men’s movie night and watch Red Dawn and talk about being at war. We’ll see how it goes. We just returned from our Fall Retreat camping trip up in Southern Utah. It was a fun time of connecting with several of our new students. We had about 20 there, and we enjoyed some great devotionals and relaxing times around the campfire. The environment is great for laughing together and also having some deep conversations on hikes as well as in camp. 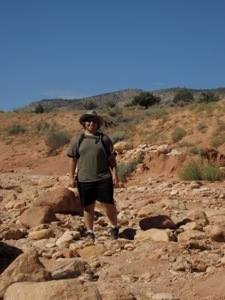 We wore everyone out with a hike into the famous Buckskin Gulch, and even waded through some deep pools of mud. I will try to link some pictures later this week. The theme for the weekend was “All Things New,” which enabled us to focus on our new life in Christ and how walking with God means our perspective and our mission and our hope are all new. It was great to see some of the students open their eyes to see new things about God even from the beautiful creation surrounding us. It was also super encouraging to hear some of the students engaging with one another about faith. I heard one student ask another one how they came to know the Lord, and overheard other conversations about how they are so glad they decided to dive into caring about their faith more up here at College. God is on the move, and we are thankful! Thank you for your prayers. Please pray that community continues to go deeper in our small groups and other activities, so that those students who were unable to come on the retreat experience that depth as well.